The CIOs of Christchurch City Council and Access Homehealth share their lessons on business continuity. earthquake that struck Canterbury, Gavin Till, IM&CT Business Unit Manager at the Christchurch City Council, counted his lucky stars. Had the former civic office on Tuam Street — and the old datacentre still within — sustained more damage than it did, and if the full data outsource to the new data centre hadn’t finished just minutes before the quake, staff and emergency crews could have been hamstrung for hours, possibly days, without access to critical IT applications and services. 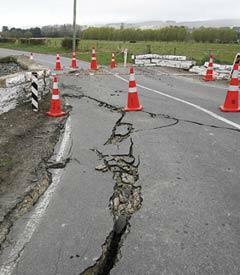 “Three months before the quake, our disaster recovery facility was in bad shape. We had allocated the funds to upgrade it, but our decision to outsource our datacentre had put this on hold. We felt that if a disaster were to happen, such as a loss of a big server, then we would be able get critical systems back up and running within a month — it was an acceptable risk. We didn’t anticipate the disaster would be an earthquake,” says Till. In hindsight, he acknowledges some of the arguments made to accept that risk would be different today — not so much about whether they would be prepared to take the risk again, but more about what they would consider to be a ‘critical system’. Another lesson learned was the importance of having a good IT and business continuity plan, with more structure around what and how they would provision IT in a disaster to avoid having to make decisions on the fly. “We coped very well, and we got a lot of things right, but it could have been much easier. We’ve learned that our business continuity plan should be appropriate to the level of services that is at risk. City critical functions such as water and waste are vital to the health and well being of a city, as is street lighting. As a consequence of this disaster the council has a better understanding of what they need as an organisation and an IT department, along with the level of redundancy and resilience required. “We are going to build a new civil defence emergency management centre, and a lot of things that were considered ‘gold plating’ are now deemed essential, such as the quality of cooling in the server room versus the redundant power supplies,” says Till. Access Homehealth, a New Zealand-owned company that cares for elderly and disabled people in their homes, came through the Christchurch earthquake in September comparatively smoothly from the IT and telephony point of view, thanks to effective workload management and data replication across a WAN. The company’s building in Christchurch was partly demolished in the earthquake, but disaster recovery procedures for both data and voice networks allowed the company to continue providing services to its clientele. “Basically, one side of the building fell off,” says CIO Philip Hendry, on the Christchurch office based in a converted Victorian-era warehouse in Sydenham, not far outside the central city. “However, Christchurch, like most of our offices, has quite minimal gear,” he says. “We run a private WAN and most of what those offices do is delivered via Terminal Services over the WAN. “We have a datacentre in Wellington. In Tauranga there is a processing centre that has a datacentre function, and in Ashburton the same thing.” Those three sites and the links between them are the main backbone of the network. “At any one time one of those sites has all the data,” Hendry says. “It makes the system very resilient. The telephone network — the chief way the company’s caregivers and clients keep in touch with one another and organise schedules – was upgraded and integrated three years ago to a Shoretel unified communications system, which also funnels its traffic through the WAN. When the quake hit, the system detected that calls weren’t being answered in Christchurch and they were automatically diverted to Palmerston North. Before the UC system was introduced, each branch used to operate independently and was staffed appropriately. Outside peak hours in particular, small centres were overstaffed for the workload. The replication philosophy extends to laptops in the field with the nurses. “Our visiting coordinators [nurses] will go out to assess a client’s needs in the field with a laptop that has a subset of the database,” Hendry says. A coordinator can electronically do the assessment very efficiently, even where not able to connect, in areas with bad mobile phone reception. The company has been looking at tablet computers to replace laptops. A device based on the open Android operating system is more likely to be chosen than the proprietary iPad, Hendry says.